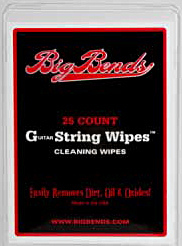 Our string wipes are treated cotton pads that protect strings and fretboards as it cleans. Quickly removes dirt, oil and oxides. Increases string life. Strings sound better longer. Safe for both you and your guitar and leaves no residue. Wipes are double bagged inside a reusable clam shell.